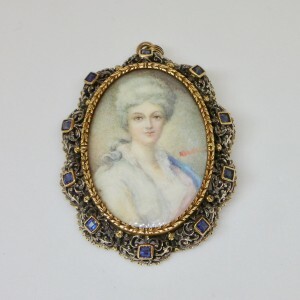 This brooch from the Liberty period can be transformed into necklace. 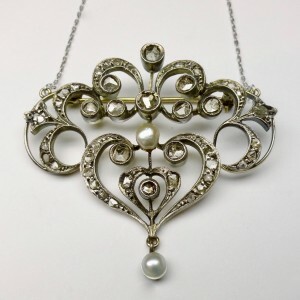 Created in gold and silver with rose cut diamonds and pearls. The chain present in photos is not included and can be purchased at an additional cost if required. 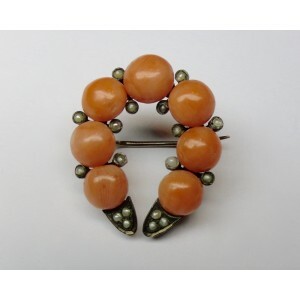 Brooch in the shape of a horseshoe set in gold with Sciacca coral and natural pearls. 1850s circa. Measurements: 2.4 cm in width x 2.8 cm x height. 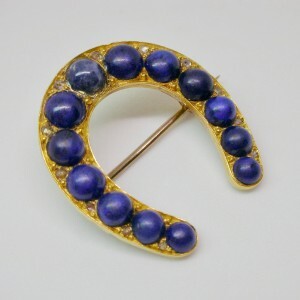 Brooch in 18KT gold with natural pealrs and a coronè rose cut diamond. Brooch depicting a half moon and a star. 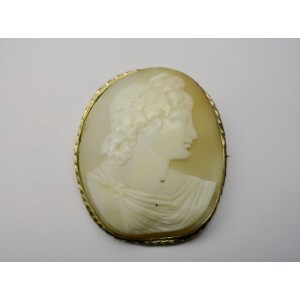 Probably of European provenance from the start of the 1900's. Measurements: 5.7 cm in width x 2.4 cm x height. Small brooch set in 18KT gold with coin from 1888 of 10 Mark depicting Frederick III of Hohenzollern, monarch of the German Empire. 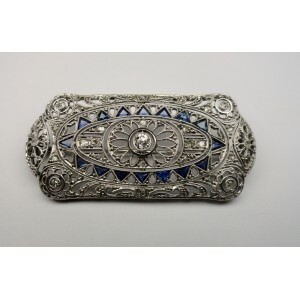 Brooch probably set at the start of the 1900's. Measurements: 3.2 cm in diameter. 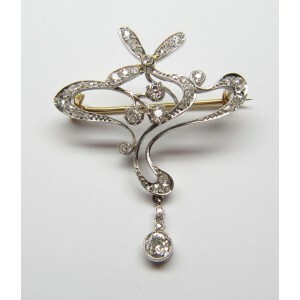 Brooch with geometric design in white gold and old cut diamonds for a total of 2.5 carats circa. Deco period 1930s. 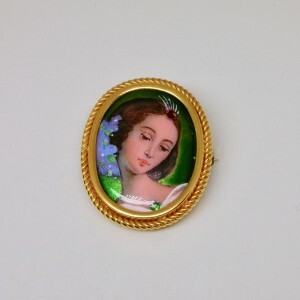 Size: 4.1 cm in width x 2.4 cm in height. 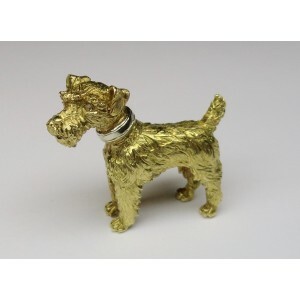 Finely designed dog shaped brooch in 18KT gold, 1960's circa. Measurements: 3 cm in width x 2.7 cm x height. 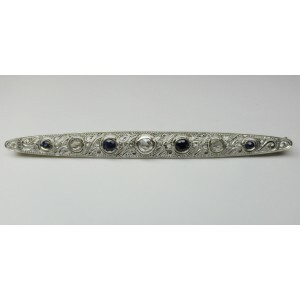 White gold brooch with old cut diamonds, beginning 20th century. 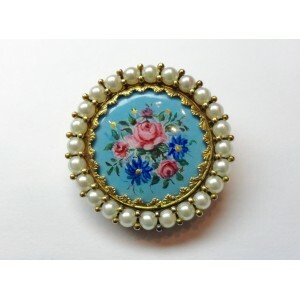 Sizes: 3.6 cm in width x 4.2 cm in height. 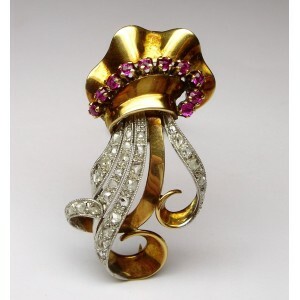 Waterfall brooch in 18KT gold and platinum with rose cut diamonds and rubies, from the 1940's - 1950's circa. Measurements: 2.2 cm in width x 4 cm x height. Bow shaped brooch in 18 carat gold with rose cut diamonds surrounding a central old cut diamond for 2 carats in total, 1940s. 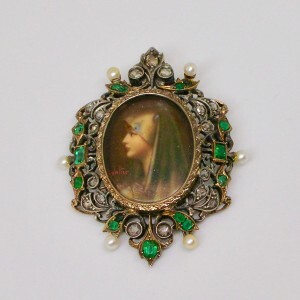 Size: 4 cm in width x 5.3 cm in height. Delicately crafted brooch in 18KT gold depicting a bee in the finest details with rose cut diamonds and coloured stones. From the 1850's circa. Measurements: 3.7 cm in width x 2 cm x height.